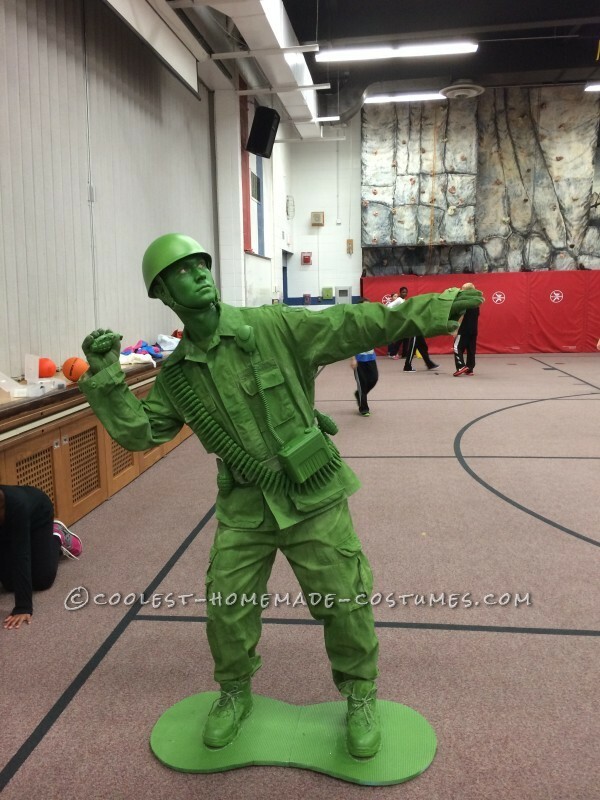 DIY Halloween Costume Idea: A Plastic Toy Soldier Comes to Life! Halloween has always been a big deal to me growing up as a kid and I would always look forward to the building process with my Dad each year. But of course, the halloween costume builiding took a back seat for the high school and college years as life became busier and busier. It wasnt until I became a teacher 6 years ago that I was able to get that feeling of building a costume back again. I dressed up as an old grandma my first year and the reaction from the kids was priceless. From that point on, it became a challenge to always outdo myself and get an even bigger reaction from the kids. In the past, I have made myself into a 7 foot tall clown (walked on stilts all day), my brothers and I dressed as Blue Man Group and danced and performed all day without talking to anyone, and last year we built 3 lifesize legos that blew people away. Every year, students and parents will say “how can you possibly top this year’s costume?” and that is the challenge that I love every year. Following the lego costume from last year, I knew I was in trouble with trying to top it because that costume took a month to make and received the best reaction yet. I struggled to find any inspiration for this year and was starting to panic as the school year made its way to October. It wasn’t until my wife began thinking about different movies that kids love, that an idea had spawned. She mentioned Toy Story and I said that I did not want to make Woody or Buzz Lightyear because those seem to be overdone. That is when she mentioned the litte toy soldiers from the first movie that go on a secret mission to see the new toys. I can remember playing with these little plastic figurines when I was a kid and would place them all over the house with my brothers. That is when I knew I had an idea but had no clue how it would turn out. The first thing I did was make a list of materials I needed that I thought the costume had to have. I found the helmet, grenades and ammunition at Party City, the boots and pants at Goodwill and the shirt at an Army Surplus Store. It’s actually a used shirt with real patches on it. I wish I could find out the story behind the shirt and the soldier somehow. It was a surreal feeling putting that on the first time, knowing that the shirt had been somewhere around the world helping protect our country. Forever grateful for our Military! After obtaining all of the basic materials I needed, I had to figure out how I could get everything the same color green, including my face. I found the green makeup I wanted to use first, then I took it to Home Depot and they color matched the paint to the makeup. I bought several cans of primer and sprayed everything twice. The primer made the clothes super stiff but it was needed because otherwise the clothes would just soak up the paint. I used an air spray gun to spray the green on everything. I did two coats on everything and then a little touch up painting on the clothes for a third coat. I think what made the costume come together was the platform that I stood on. I used gorilla glue to glue the boots to the yoga mat I found. I also glued cardboard to the bottom side of the yoga mat so that it wouldnt get all torn up from walking on the different surfaces at school and outside. I wasn’t sure what the reaction would be at school. I knew I had a good idea for the costume but I was not sure if it would all come together the way I wanted it to. But when I put the makeup on at school that morning and the rest of the costume piece by piece, I knew I might have something cool. My wife took a picture of me on my phone and when I saw it for the first time, I couldn’t believe how good it had turned out. 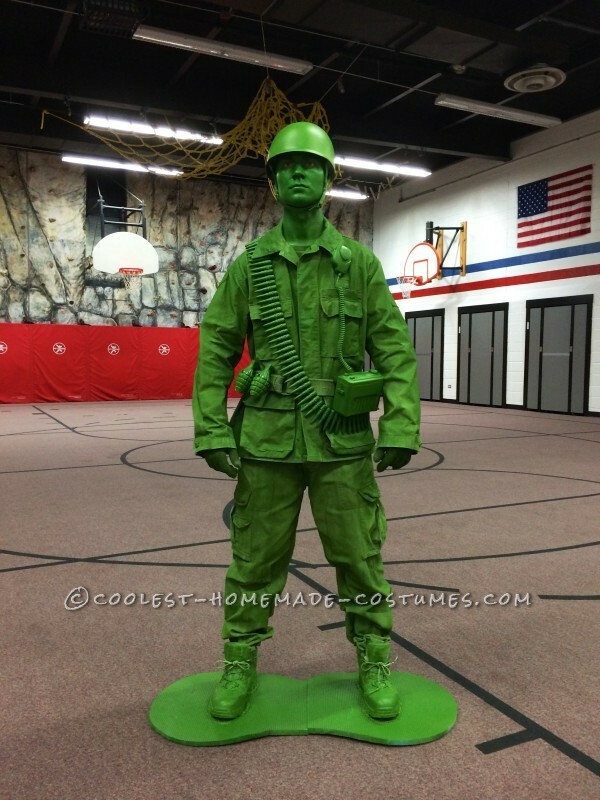 I walked out to our school lobby and stood like a statue for a few minutes and the staff at my school couldn’t beleive it. Once the kids started showing up at school, the reactions just got better and better. 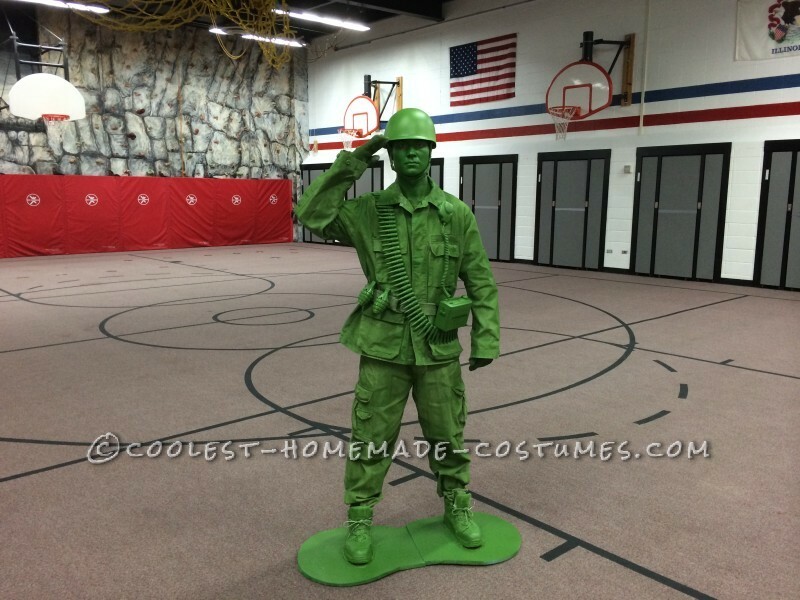 When the kids would come to PE class with me, I would talk in a military tone and have the kids always answer to me “Yes Sir!” Our school always has a halloween parade in the afternoon and the parents are always invited to come take pictures. This year it happened to be raining the whole time so the parade was moved indoors and the parents were all directed to the gym. By parade time, the gym was packed and standing room only. Because of my limited walking ability, I stayed in the gym the whole time. The reaction from the parents was priceless! My eyes started to hurt from all of the pictures that were being taken. Some even walked right past me into the gym and thought I was a statue! It was an incredible day wearing the costume and a day I will never forget!